As I was writing an email to a sister this morning, it occurred to me that it might be expedient for us to let the brethren know that the Lord is moving in Germany. Our time here has been very productive, both concerning the mind of God for Germany as well as for Nancy and myself. As it applies to us, the scheduling over the last two years has been quite heavy with very little down time for us to be able to catch our breath as well as catching up on our strength. I think that we were both running on the reserve tank. You know that little light that looks like a gas pump that is displayed on your dash when you run out of gas? Well I think ours was in the blinking stage. Needless to say Nancy and I have appreciated the graciousness of Brother and Sister Doerge for their hospitality and generosity. On the spiritual side of things, our visit here could not have been timelier. It was on the last visit earlier this year that Nancy and I both felt quickened of the Lord for us to return before the end of the year. Our desire was to spend a longer time of fellowship with the brethren whom we knew and had fellowship with more than seventeen years ago. It was determined in the course of time that the time should be now. With that being said, we arrived at the Cologne/Bonn airport on the 5th of August and were very warmly greeted and welcomed by Brother Harmut and Sister Hannelore Doerge. Things were quite peaceful and quiet for the next few days. On Sunday there was a scheduled time of fellowship for the whole day with a family that we had previously been in fellowship with, but over the course of time and life’s events we lost contact with them. This particular family was part of the original group that was started here in the beginning of the work that Brother duCille pioneered. Our time of fellowship on Sunday was a blessed time and a divine appointment. I believe that it was during the night and the following Monday that Sister Hannelore had a physical attack on her body. The symptoms were severe cramping and nausea. That Monday morning her husband took her to the doctor who immediately sent them to the hospital. After being examined it was determined that there might be the necessity for an operation – an operation that would have some serious consequences as well has creating a major disability for our sister. I felt in the Spirit that this attack was more spiritual than physical. Nancy and I began to send out a prayer alert to various people in various places in the world concerning the situation and what we needed God to do. The perception was in the Spirit that our presence here was helping to create a bulwark between our sister and the plans of the devil and that we were in some sense of the word, a first alert system that God had put into place for such a need. I am not sure that there is an awareness of those who have been involved in the work of God in this place, as to the importance that Brother and Sister Doerge have played in building a platform in Germany. You could just as well say a stronghold, for the work of God as it pertains to Germany and the strategic place that it takes. Nevertheless, our lack of understanding has not hindered the devil in his perception of it as to its importance in the economy of God. As far as that goes, the longer we are kept in the dark about it, ignorantly or willingly, the better it is for the devil. Can two people be so important in the midst of hundreds of thousands as far as the work of God is concerned? The answer to that one is absolutely. If there had not been a Lydia, there might not have been a church in Thyatira. Thus there would not have been a church to plant the seed of Sonship in what is now called Turkey; moreover, of equal importance a platform on which Asia could be reached. Had there been no Priscilla and Aquila of Pontus, Italy, there would not have been an Apollo to advance the Kingdom of God. Individuals, by the selection of God, will always be ordained of God for the advancement of the Kingdom of our Father. As it was then so it is now. As it was appropriate for the ministry to establish and strengthen the work of righteousness in those places and to the people to whom they are sent, so it is also pertinent for us in this time frame to strengthen the work in this place that the Kingdom of Light might prevail over the kingdom of darkness that now has the preeminent rule over this land and this people. You may not be aware of it, but your prayers have indeed worked a miracle as far as our sister is concerned. Jehovah Rapha (The Lord That Heals) made his presence known and our sister was delivered from the plan and purposes of Hell. Another major confrontation with the Black Knight of Bavaria ended in his defeat and failure to stop or stifle this Word of Sonship. For that we are praising and rejoicing in the Lord. 1Pe 2:1 Wherefore laying aside all malice, and all guile, and hypocrisies, and envies, and all evil speakings, Vrs:2 As newborn babes, desire the sincere milk of the word, that ye may grow thereby: Vrs:3 If so be ye have tasted that the Lord is gracious. Vrs:4 To whom coming, as unto a living stone, disallowed indeed of men, but chosen of God, and precious, Vrs::5 Ye also, as lively stones, are built up a spiritual house, an holy priesthood, to offer up spiritual sacrifices, acceptable to God by Jesus Christ. Well it is at least morning for Nancy and I, depending on where you are in the world, it could be for you yesterday’s Good Evening or Good Night, maybe even Good Afternoon as it would apply to the West Coast of California. So in most cases you are reading the thoughts from one who is in the future speaking into the past. Interesting thought, isn’t it? Have you ever had the thought that if you could live a day over again, you would do something different? Well it seems in some respect that we, Nancy and I, have had that opportunity a number of times, for when we leave Africa or the Philippines going to the States, more often than not we go back in time at least 6 to 14 hours or more, depending on where in the world we may of be. I am not so sure that we are cognizant of it, for the reason that whether you are in the present or the future, you are always taking your current state of mind with you. It is a thought that one needs to meditate on, especially when you think of the scripture that says that we are to redeem the time. Perhaps we should have a bit of a Greek lesson here; the word Redeeming comes from the Greek word G1805 ἐξαγοράζω or in English exagorázō; fut. exagorásō. This particular word is the combination of two words. It comes from ek (G1537), out or from, and agorázō (G59), to buy. To buy out of, redeem from. If something is in something else, then the separation from it is expressed with ek, out of, while if it is near it, on it, with it, then apó is used. If you would look at the Thayer definition it says; G1537 ἐκ, ἐξ ek ex ek, ex. It is a primary preposition denoting origin (the point whence motion or action proceeds), from, out (of place, time or cause; literally or figuratively; direct or remote). So it would seem that if you are dealing with time as to its need to be redeemed, that means that time in and of itself has been taken captive and is being utilized for another purpose; to redeem it you have to go back to the source from which time became, which of course is Gen 1:1-5; time was created for a specific reason and a specific purpose; the reason for which time in and of itself was created is quite clearly stated in Gen 1:26; man might be created in the Image and Likeness of God. It would also be good to link this particular thought to the New Testament for those who might think that the Old Testament is nothing more than a history book and not the foundation on which the New Testament is built. That means you have to go to Joh 1:1 In the beginning (in the beginning of what, would it not be time in and of itself) was the Word, and the Word was with God, and the Word was God; being that we have to take scripture in context with itself it says that in v:3 All things were made by him; and without him was not anything made that was made. When you refer to the Word of God, you are referring to the Bible; yes, I mean that Bible you have, probably on the shelf or on the table. So see the transition; In the beginning (of time) there was an entity that is called THE Word/God, that Word established the perimeters of what was being created, for v:4 In him was life; and the life was the light of men; as well as what it was being created for v:12 But as many as received him, to them gave He power to become the sons of God, even to them that believe on his name. It also defines the how of it; v:13 Which were born, not of blood, nor of the will of the flesh, nor of the will of man, but of God; as well as a product that it was to produce v:14 And the Word was made flesh, and dwelt among us, (and we beheld his glory, the glory as of the only begotten of the Father,) full of grace and truth. Now remember we are still dealing with the redemption of time. The word redemption is the Greek word ek-agorázō. I have hyphenated it for clarity, ek as Thayer’s explain above is a primary preposition denoting origin whereas agorázō means to buy, to buy out of, redeem from. It means that we/humanity must go to the source of time which is of course God and make an expenditure of ourselves in order to redeem the time element that we are residing in (Col 1:27 To whom God would make known what is the riches of the glory of this mystery among the Gentiles; which is Christ in you, the hope of glory.) In other words we/humanity must reach into Eternity/God and pull that Eternity/God in to the element of time through the portal of man; in order for the redemption of it (time) to be redeemed. Rev 3:18 I counsel thee to buy of me gold tried in the fire, that thou mayest be rich; and white raiment, that thou mayest be clothed, and that the shame of thy nakedness do not appear; and anoint thine eyes with eyesalve, that thou mayest see. Time was created for a specific purpose (1Joh 3:1-2), but that purpose was seemingly derailed, but in reality it was structured in such a way that God in the midst of time and by the end of time would be able to finish the creation of a man that would be timeless; Joh 1:14 And the Word was made flesh, and dwelt among us, (and we beheld his glory, the glory as of the only begotten of the Father,) full of grace and truth. 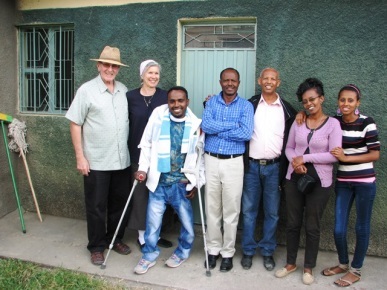 I want to share with you some of what has been happening here in Ethiopia. We arrived here on the 10th of January. As some of you might know or may not know, when we left Ethiopia in October of last year, God orchestrated our move in having us give up the house that we had been renting for a year; the lease was to be up in February of 2015. It was not too long after that that Nancy and I were both smitten with a bronchial infection of some sort that was by no means some little thing. We both were very much aware that it was the devil working to discourage us and to keep us from accomplishing that which the Lord had sent us here to do. So we both agreed in the spirit that we would not allow that to happen. We by His grace were able to keep all of our appointments and to do many of the things that needed our attention concerning the NGO; not only that but as of two days ago we had a break though in the Spirit and we both recognized the healing of God coming into our bodies. The RBW-ETH in and of itself has grown as to the staff that is now employed by it. We have an Accountant, Secretary-Cashier, a Social worker, as well as Director, all of which are on salary as well as having the benefit of a pension fund. We have also been able to enlist the help of Bro Seife, as a consultant coordinator. It is a temporary position, but his input and collaboration has been a valuable asset to the ongoing development of RBW-ETH. Considering where we were last year as of August 2014, and the trouble that the devil was giving us in having a reorganization of the original proposal that the government required; taking us from 12 single parent homes to 75 children and their respective families, all of which I am saying at the time, “How can it possibly work out?” As you can see by the picture below, it is truly amazing what God has done to prosper this work. In the beginning of it we had 12 single parent homes and 3 widows that we were taking care of; today we have 75 children with their participating families and we will have 10 widows that will be sponsored and trained in some form of work to be able to provide for themselves. But most importantly we have an instant church/field in which to plant and water as God will give us the increase. When we were in Ethiopia in May/June of 2012, the Lord spoke to me very clearly and He said, “Go after the children.” It was out of that word that God began to open the doors to give us the opportunity to come now to the place that we are at. It is the size of the field that is a bit overwhelming and the need that is evident. It reminds me of the word that Jesus spoke Mat 9:36 But when he saw the multitudes, he was moved with compassion on them, because they fainted, and were scattered abroad, as sheep having no shepherd. So it would seem in such a situation as this v:37 Then saith he unto his disciples, The harvest truly is plenteous, but the labourers are few. Please pray with us, even as Jesus has instructed us to do; v:38 Pray ye therefore the Lord of the harvest, that he will send forth labourers into his harvest. PS: If any of you that are reading this letter are quickened by the Lord to sponsor a child or to help in any other way please contact us at info@rbwonline.org or reach us by phone at 224-612-2507. Eph 5:16 Redeeming the time, because the days are evil. Col 4:5 Walk in wisdom toward them that are without, redeeming the time. Rom 8:20 For the creature was made subject to vanity, not willingly, but by reason of him who hath subjected the same in hope.